Menlo-Atherton Little League is working to enhance, beautify and make safer Holbrook-Palmer Park and the surrounding area. A plan is in place to make enhancements to the existing field as shown in the images below. Please click here to Donate to the Holbrook-Palmer Project. You may also download our Holbrook-Palmer Fund Raising Flyer. NEW! M-ALL is now accepting STOCK DONATIONS! Click the Donate link above to initiate the process. 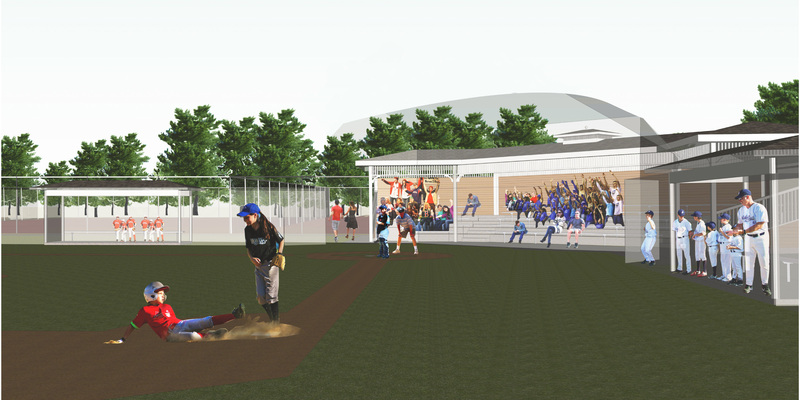 The new Holbrook-Palmer ballpark will include a covered seating area for fans and spectators. A major field renovation will be done to upgrade the playing surface, pitching mound, infield and outfield grasses. A temporary fence will be put in place on game days to improve safety for other park users. H-P Park is primarily used by M-ALL's AAA Division, comprising boys and girls ages 8-11. Covered dugouts will be added on both 1st and 3rd base sides, giving the players a feel of playing "real baseball" and also improving safety for both the players and coaches. In the rear of the facility will be public restrooms, available to players, fans and the greater Holbrook-Palmer Park user community.